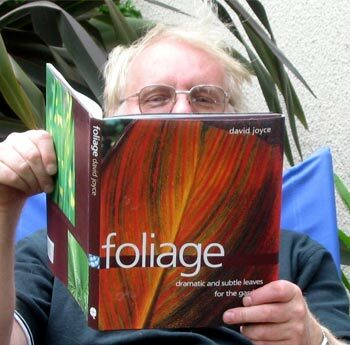 There are lots of tempting foliage garden books - this one simply called Foliage, with its striped canna leaf cover, was a Christmas present a few years back. I like it very much. Obviously, successful gardening book presents have their own special magic and surprise. The gardening book Foliage was purchased in London, and I'd never seen it before or heard of the author. The mathematician in me was immediately impressed by the geometrical descriptions of the author. He divides his foliage into the most delightful categories - but they're not too botanical,and won't scare off an amateur. You'll enjoy, for example, the 'Hairy and Bristly' chapter - and you'll know exactly what to expect in the 'Tufts and Clumps' section. These whimsical and descriptive titles are followed by imaginative and informative writing, and there are the most wonderful photographs to encourage you further.